If you have a water softener you might notice that sometimes they can develop condensation around the tank. This can cause mold and mildew to grow and create very noticeable odors and even be hazardous to your health. This is caused by all the excess moisture in the air. 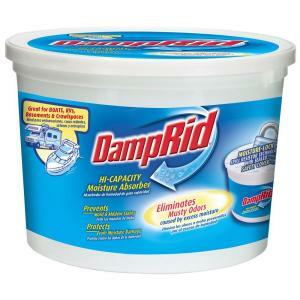 DampRid 4lb High Capacity Moisture Absorber eliminates excess moisture in the air, prevents stains and damage caused by mold and mildew and can eliminate odors caused by the moisture. The High Capacity Absorber prevents mold stains by eliminating the excess moisture that allows mold and mildew to grow. It won’t dry the air excessively to damage plants, furniture or household goods. DampRid can be used in the basement, crawlspace, garage, cabin, boats, RV’s, and campers or anywhere that excess moisture and stagnant air are the problem! And its exclusive Moisture-Lock technology combines a spill resistant safety cover and a natural absorbent media in the bottom of the pail to resist spills and it also lasts up to 6 months!